10,000 Man March is a watered down extension of "Justice or Else"
who would with crap like this? Puerto Rico, located about 40 miles from the U.S. Virgin Islands, has been at the center of attention in the aftermath of devastation from two powerful hurricanes. But, it seems many have overlooked the smaller islands that were also greatly impacted, specifically the U.S. Virgin Islands which are facing their own crisis. Mr. Muhammad explained how they circulated donation letters and had a meeting with a representative of the volunteer ministry of the Church of Scientology, who agreed to sponsor 10 volunteers. They have a ship called ‘Free Winds’, that they use to transport relief supplies. “Once we get volunteers, we will go to St. Croix on the ship and stay for about a week, or longer. We will have the items they already requested for their daily needs,” he added. There’s a four-point plan by which ‘Operation Build and Restore the Virgin Islands’ are hoping could bring about relief to those citizens. First, putting on a benefit concert with local artists to bring more attention to the devastation, while also lifting the spirit of the residents. Secondly, asking for contractors and builders to aid in rebuilding, also calling for food farming, permaculture, or natural-food preservationists to help designate and secure specific areas to plant so that food would grow in multiple areas. Lastly, many people are traumatized by the catastrophic events and they would like to provide counseling for as many people as they can. Looks like the followers of the NOI haven't run into disconnection and the breaking up of families .....yet. I wonder how that will set with them and how they will handle that. Do these members of the NOI not have the internet? with their hybridized version of it..yikes! 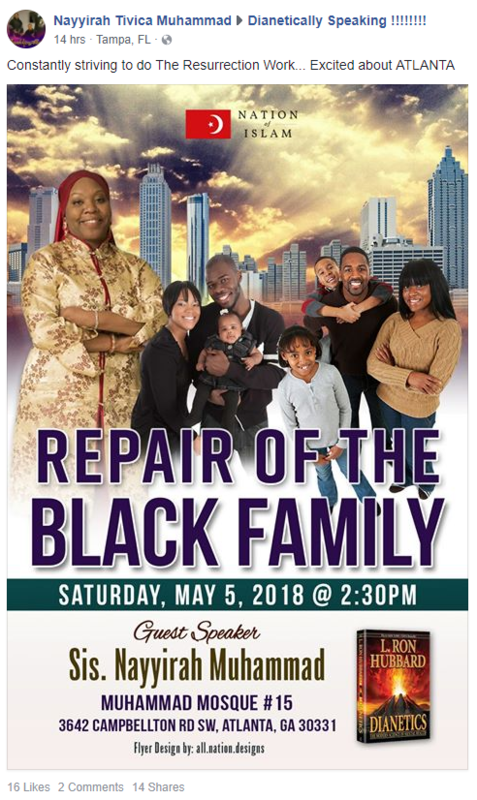 Farrakhan 's Scientology minions interject..flail and try and justify it as a divine prophecy..
Malik Zulu Shabazz repeatedly posted this message "encouraging private MH counseling from trained mental health professionals". about people disclosing his extra marital affairs..
he also spoke out about the Scientology stuff..
"Contrary to what the title may suggest, this is not an article about the Nation of Islam’s (NOI) First Lady, Mrs Khadijah Farrakhan, or any of the other purported Muslim ‘wives’ of NOI leader Minister Louis Farrakhan such as ‘Sister Arifah’, ‘Sister Zinab’, ‘Sister Karen’, ‘Sister Tynnetta’ or any others. Rather, this article concerns itself with those alleged violations of the NOI’s institutional legal code – the so-called Restrictive Law – arising from Mr Farrakhan’s extramarital affairs with female celebrities such as the actress-singer Lola Falana and (it’s been rumoured) the Tony award-winning singer Melba Moore. Concerning Ms Moore, there is a further allegation that Mr Farrakhan may have embezzled $50,000 in NOI funds to pay off debts owed by the soul diva during the 1980’s. The large sum of money involved has led to speculation that the payment may have been ‘hush money’ aimed at dissuading the artist from resolving her financial difficulties by selling a ‘kiss-and-tell’ story about her presumed romance with Mr Farrakhan to the news media. If true, this affair has all of the hallmarks of the NOI’s very own iteration of the 1994 NAACP scandal in which Benjamin Chavis, the group’s former Executive Director, was dismissed from his post over his misappropriation of $300,000 in the civil rights organisation’s funds in order to settle a sexual harassment lawsuit." 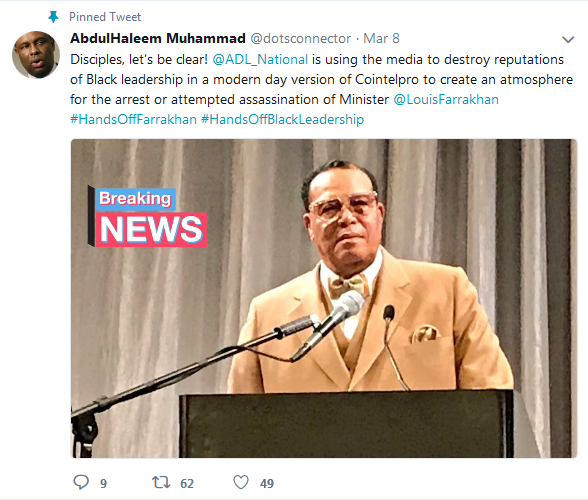 "Each of the allegations contained herein derive from the writings and broadcasts of NOI dissident Lance Shabazz as well as from individuals associated with Mr Farrakhan’s elite ‘Executive Protection’ personal security detail (commonly known as the ‘E-Team’) and who have shared their revelations in a well-known NOI online forum." Calypso Louis "Auditor" Is gonna have a field day..
Lance Shabazz was a long time archivist and media host for the NOI who publicly quit. "In his Moving On webcast, Mr Shabazz has also alluded to wild celebrity parties that were held by the late actor Calvin Lockhart and that were attended by Mr Farrakhan and during which the NOI leader engaged in activities which, in the words of Mr Shabazz, “would shock you.” Whether or not any of these alleged activities involved misconduct that contravened the RL-NOI remains to be determined but Mr Shabazz’s imputations are especially disquieting since he makes them as someone in a position to know or who otherwise has access to individuals who possess first-hand knowledge of the implied indiscretions." Judical Watch is still pursuing records on this murder..
there were hundreds of stories written on this indecent..
Calypso Louis "Auditor" Is gonna have another field day. it will be Louis Farrakhan and crew perusing those confidential Auditing folders. 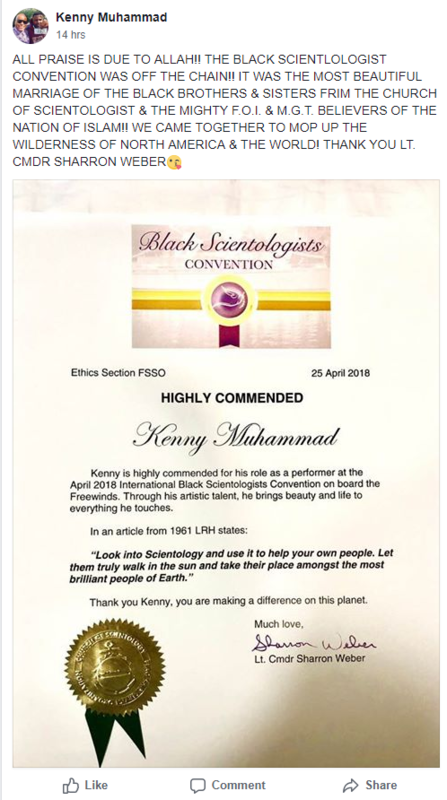 Nation of Islam Brother Kenny Muhammad "Highly Commended" for his role at the Black Scientologists Convention. "to bring you the Supreme Wisdom [i.e., the wisdom of Master Fard Muhammad and Elijah Muhammad] and the Supreme Technology [i.e., Scientology]." 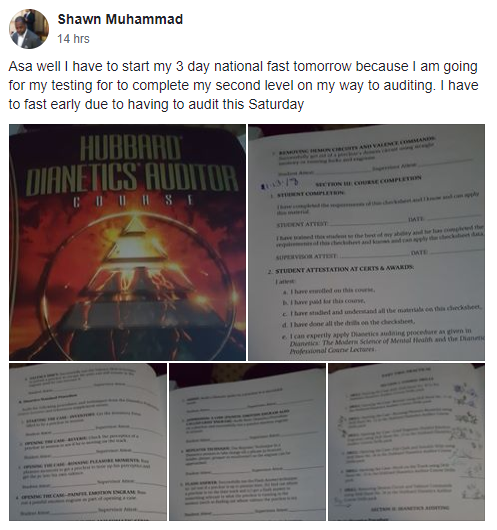 "the technology of Mr. L. Ron Hubbard under the guidance of our dear beloved father The Honorable Minister Louis Farrakhan"
"I want to share with my journey with you this process going Clear"